Shaban, M. (2014). Effect of Reactive Oxygen Species on Germination and Lipid Proxidation in Sunflower Seeds. International Journal of Advanced Biological and Biomedical Research, 2(6), 2086-2090. Morad Shaban. "Effect of Reactive Oxygen Species on Germination and Lipid Proxidation in Sunflower Seeds". 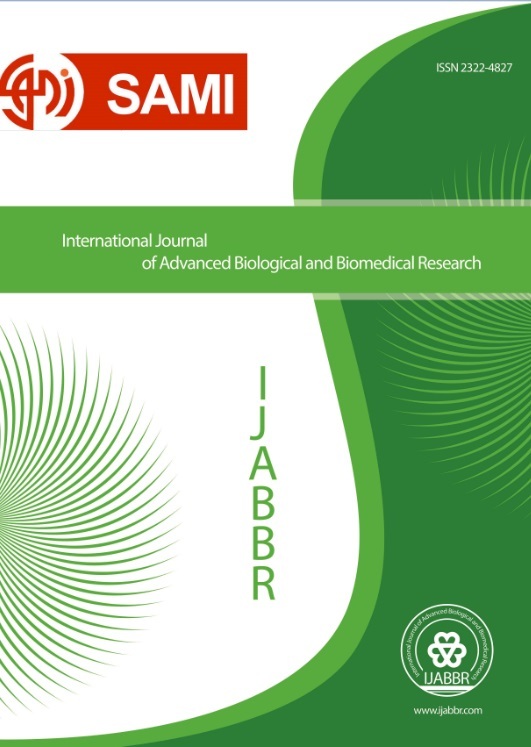 International Journal of Advanced Biological and Biomedical Research, 2, 6, 2014, 2086-2090. Shaban, M. (2014). 'Effect of Reactive Oxygen Species on Germination and Lipid Proxidation in Sunflower Seeds', International Journal of Advanced Biological and Biomedical Research, 2(6), pp. 2086-2090. Shaban, M. Effect of Reactive Oxygen Species on Germination and Lipid Proxidation in Sunflower Seeds. International Journal of Advanced Biological and Biomedical Research, 2014; 2(6): 2086-2090. Reactive oxygen species cause to release of dormancy in many plants such as sunflower seeds. This study investigated in order to evaluation role of reactive oxygen species germination and lipid proxidation in sunflower seeds. This study was performed in two separate experiments, each in a completely randomized design with factorial design with four replications. In both experiments, uses from dormant and non dormant seeds of sunflower. It also applies of treatments Methylviologen and Cyanide in dormant seeds which are the producers of reactive oxygen species. Finally, germination lipid proxidation were evaluated as well. The results showed that the main reason for release of sunflower seeds dormancy is production of reactive oxygen species is an acceptable level so that seed germination of dormant seeds which was treated with Methylviologen and Cyanide was more than dormant control seeds and was similar to non dormant seeds. The amount of lipid peroxidation product malondialdehyde in dormant seeds was less than non dormant seeds and seeds treated with Methylviologen and Cyanide.